Substance makes a system observable and manifest. All substance is a combination of matter, energy and information. 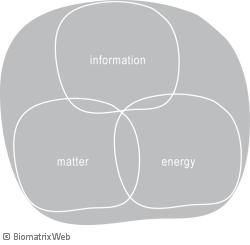 These three components occur together and form an interacting field which we call mei. For example, a chair is a material thing, it has embedded information and kinetic energy. An idea is information but requires matter and energy to record and perceive it. Substance manifests as Mei (matter like an artefact or organism), mEi (energy like electricity) and meI (information like an idea or plan). In an organisational context, substance refers to components, resources and infrastructure (e.g. human, material, knowledge and financial). The core problem of material substance is that it is limited (i.e. scarce). Likewise, the material components involved in harnessing energy make it scarce, even if energy itself is abundant. Scarcity leads to competition, which is a win / lose and zero sum game. For example, depending on how I share my property or money with others, one of us loses some, the others gain, while the total remains the same (i.e. is zero sum). By comparison, information is unlimited, abundant and in sharing it one does not lose it (i.e. allowing win / win). It is also synergistic (i.e. interaction of existing information can give rise to new information). To achieve synergistic effects requires cooperation (i.e. sharing it). The term information is derived from Latin and means putting form into. We distinguish between information and in-formation. Information refers to descriptive data that record and explain. In-formation refers to prescriptive data which change a system (i.e. it is a governance force). In-formation is the substance of the conceptual reality of a system, which represents the field perspective of the biomatrix. For example, the data in a filing system are information, while values and policies are in-formation. The nature and quality of its substance is an important organising force of a system. For example, introducing a new technology or training staff changes the organisation. Scarcity of material substance demands careful management of limited resources through sustainable development. The synergistic nature of information demands management of stakeholder interaction.